The Ganges from Fontana dei Quattro Fiumi by Gian Lorenzo Bernini. Located at the Piazza Navona in Rome, Italy. The closed loop of love and destiny encircles a man and his deceased wife after his wish for her return is granted. Influenced by T. S. Eliot's The Waste Land, Tiresias uses the topography of Rome and the structures of rhetoric to further the timeless relationship between its eponymous namesake and the Cumaean Sibyl as reflected in the extraordinary lives of an erudite young couple who share a love for classic literature, art, music, film and the words that bind them. The historical sense involves a perception, not only of the pastness of the past, but of its presence. 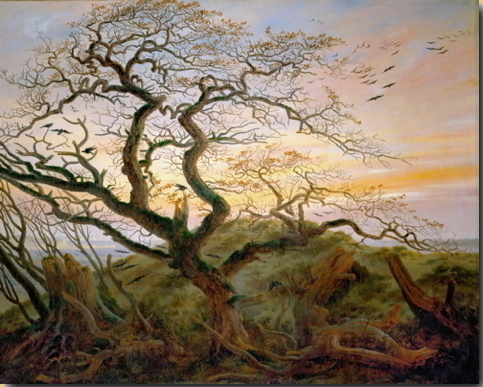 The Tree of Crows by Caspar David Friedrich. Located at the Musée du Louvre in Paris, France. Upon learning of the death of his only child, an American scholar of medieval European literature imposes upon himself an exile equal to that of his condemned hero Dante Alighieri and wanders the French countryside in search of the meaning of life. You call me a misanthrope because I avoid society. You err; I love society. Yet in order not to hate people, I must avoid their company. 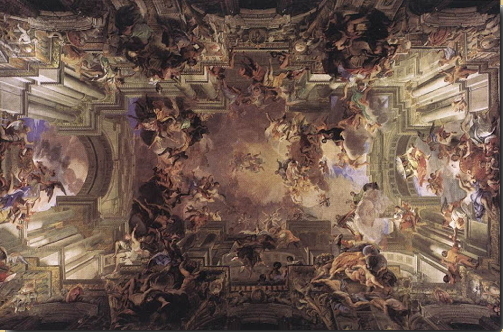 The Apotheosis of St. Ignatius by Andrea Pozzo. Located at the Gesu in Rome, Italy. A young woman and her friends are approached by a stranger who reveals to them a way of life that requires a total committment to the unknowable. He who goes about to reform the world must begin with himself, or he loses his labor.